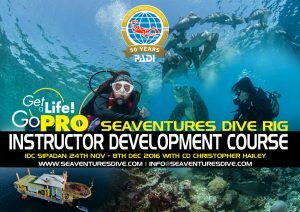 Get a life, Go Pro with Seaventures Dive Rig’s PADI Instructor Development Course in Mabul. 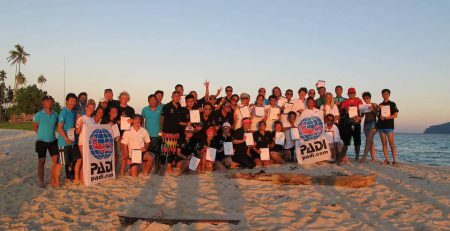 The next PADI IDC will on the 24th November to 8th December. For those who are currently Divemasters and looking to live the dream, the IDC is a two weeks program that includes classroom work, confined and open water teaching. The IDC teaches you to conduct all PADI core courses. You will be taught be able to organize and present information, conduct skill development sessions and control open water dives. You will be trained to be good at demonstrating skills while watching out for student diver safety. During the PADI Instructor Development Course we run additional workshops in marketing, touch products, e-learning, technical diving and much more to give you extra training that will help you become a well-rounded PADI diving instructor. The Instructor Development Course is conducted in the comfort of our unique setup, the Rig. The confined and open water dives will be done in world renowned dive site Mabul island and Kapalai. Sipadan island is also just a 30 minutes boat ride. Emergency First Response Primary and Secondary Care(CPR and First Aid) training within the past 24 months. In the all inclusive IDC package, the prices includes return transfer, accommodation, full-board meals, material and dive equipment use. Sipadan diving permit and fees is also included the price. Candidates will still need to pay for the fees due to PADI. Find out more about our PADI Instructor Development Course. Email us at info@seaventuresdive.com. You may also read about our Course Director Christopher Hailey and how the course is run here.